Steve Irwin, probably one of the best known advocates for wilderness and animal conservation in the world, tragically passed away recently in North Queensland, Australia. He was arguably Australia’s best-known science communicator, although he was more popular overseas, particularly in America, than he was at home. 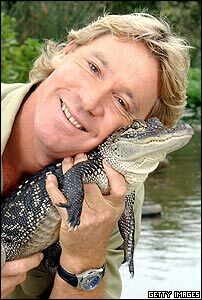 His unconventional methods of communicating his work – some say he provoked animals to get them to attack on camera in order to bring viewers to his Crocodile Hunter television series – drew criticism from some and inspired others, yet it is unarguable that Irwin will have a lasting effect on the environmental and conservation movements in Australia and around the world. Unlike so many other “wacky and zany” science communicators – and there are plenty of them in Australia – Irwin was so genuinely passionate about his cause that he bought millions of dollars of land worldwide in the name of wilderness and animal conservation. How many people can you name that have become famous to some degree through their television persona that have taken the next step and invested a large percentage of their rewards in their cause? I can barely think of one other. And nothing he ever did on screen was fake – he loved what he did and this shone through in everything that he did – whether it was on his television show, in interviews or just when he was being himself. He was genuinely passionate about what he did and was not afraid put his money where his mouth was. Personally, I admire his passion and wish that I had had the chance to meet him. I must admit my viewpoint here is slightly informed by having met other well-known science communicators in Australia who bank on their personality rather than their in-depth knowledge of science – even Irwin admits he was not the smartest bloke around – who off-camera are still “wacky and zany” but are in no way nearly as passionate about their cause as Irwin was. I can not imagine Irwin fobbing off a young person passionate about conservation by saying “its all too hard to get into this industry”, which has happened to me more than once with high profile communicators. Indeed, Irwin employed over 500 people at the amazing Australia Zoo (which I visited this year) and was constantly encouraging people to take up his cause in whatever way they could. He never said it was all too hard. I believe that education is all about being excited about something. Seeing passion and enthusiasm helps push an educational message. That's the main aim in our entire lives is to promote education about wildlife and wilderness areas, save habitats, save endangered species, etc. So, if we can get people excited about animals, then by crikey, it makes it a heck of a lot easier to save them. Some say that he deliberately provoked animals into attacking him to make good TV. I have not analysed his whole body of work, so it is probably not for me to comment. But in any case, David Attenborough gets chased by elephant seals and does not have to say “Don’t try this at home”. The reason Irwin was popular was not because he made animals attack (if that’s what actually happened), it is because he got into people’s hearts and minds. Australian’s sometimes did not like the cultural cringe that came with him, but who cares?! He was funny, passionate, called great ugly crocodiles “beautiful sheilas” and inspired millions of people world wide to take an interest in animal habitat conservation. It takes all kinds of communicators to effectively convey science to the public, and Irwin fantastically fitted his section. Indeed, a lady from Brisbane was able to save her son from a snakebite because of what they had watched on his show – now that’s effective science communication! And finally, I would like to also make mention that the RSPCA in Brisbane called him a modern day Noah because of his conservation work. “His loss will be felt by animal lovers not just in Australia but all over the world”, said RSPCA Qld chief executive Mark Townend. RSPCA Queensland spokesman Michael Beatty, who first worked with Irwin when Irwin was just 15, said Mr Irwin's contribution to society would only truly be recognised in the years ahead. If there is any organisation in the world qualified to comment on whether Irwin’s methods were cruel to animals and whether he became popular through less than noble means, it would be the RSPCA. Yet they are calling him a modern day Noah. I hope that into the future we realise Irwin’s legacy and pay tribute to a man who, although he didn’t appeal to everyone, has made a tremendous difference to the environmental and conservation causes around the world. My deep sympathies also for his family, as his other passion was clearly for them. His is truly a tragic loss. It is not the critic who counts - not the one who points out how the strong man stumbled or how the doer of deeds might have done better. The credit belongs to the one who is actually in the arena, whose face is marred with sweat and dust and blood… Who strives valiantly… who errs and comes short again and again… who knows the great enthusiasms, the great devotions, and spends himself in a worthy cause - and who, if he fails, at least fails while daring greatly, so that his place shall never be with those cold and timid souls who know neither victory nor defeat. especially the last quote from Roosevelt.